So you want a recording contract (Part 3)? 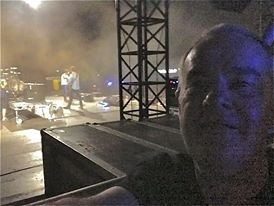 This week our industry insider from Circle Recording Studios in Birmingham sends his words of wisdom from backstage at Benicassim (that's him, above, watching the Kaiser Chiefs). Previously I've talked about how your brand is central to your success and how developing it carefully is central to giving you the best shot you have of engaging with the audience you actually want to engage with. That means getting into the mindset of that audience and thinking about what will turn them on. So what kinds of things could damage your brand? That's the tricky bit. To be honest, you'll never be able to make everyone happy. Haters are gonna hate. But what you can do is make sure that you don't turn-off the ones that are important to you. This means, at the least, being smart about it. I've mentioned some of the things that seem obvious to me in previous blogs but today I'm gonna explain (spelled 'm-o-a-n') about one of my pet-peeves. How many of you have received emails or pm's on Myface/Twit-Tube or even texts asking you to do a favour for a complete stranger and just listen to their latest record? Drive you almost as mad as those fvckwits that constantly send bejewelled requests? Yep, me too. Worse still, some of them ask you what you think. Only they don't want to know what you actually think. They just want you to listen and be appreciative. So, quick question for you... (even if you are in a band, your probably a consumer of other people's music too) ...have you recently listened to a single request like this from a complete stranger? I went through a period where I would try and spend just a little time every day listening and offering suggestions to people who had sent such messages to me. But not any more. Fundamentally I realised that people don't appreciate even constructive criticism and, as the old adage goes, 'no good deed goes unpunished'. As a result, nowadays I tend to transfer them immediately to the magnetic graveyard in the sky. Of course, I'im still human, so very very occasionally (in a once-in-a-blue-moon kind of a way) one of them actually sparks my interest (more on this later). Honestly though, the generic mass mailings from random strangers never capture my imagination. As a result, I never actually listen to the track. How about you? Nope? So if you are thinking about sending one of these generic 'please listen to my song' messages, do you really think it's worth your time and effort? Honestly if that's really the best you can do, then do us all a favour and give up on the PR game. Now I can already hear you artists who regularly post such requests to random strangers saying under your breath "Come on Trev, it just can't do that much harm, can it? You said yourself that you do listen very occasionally. Someone really worthwhile might listen to it, right?" While that might be right, in my view, the risks are high. My friend and mentor, rock producer Michael Wagener, once said to me "never forget Trev, you are only as good as your last record". What he meant by that is that, particularly in this industry, people have short memories. Remember I pointed out above how important your brand is? If your brand becomes synonymous with spam mail, how useful do you think that is? In reality, it's no better than getting your bum out all over again. So let's try and make a positive out of it by flipping it back around. On the few occasions that you do listen, why do you? Next week we'll start to think about tactics for turning on your various audiences and turning them into your fan base. Until then, keep it reel. The author of Machiavelli's Guide, Trev is a record producer and Chief Engineer at one of the UK's top studios, Circle Recording Studios in Birmingham. Check it out at www.circlestudios.co.uk. He has worked with clients ranging from Samplephonics to Yamaha Corporation's R&D team and drummers including Fergus Gerrand, Ian Palmer and Simon Edgoose. As this blog goes to press, he is still suffering from the after effects of Benicassim. Go follow @circlestudios on twitter if you like the kind of inane rambling you get to read here or look up Circle Recording Studios Birmingham on Facebook.